- Can Be Easy ! YOU can inspire people with your words. YOU can be a persuasive speaker. 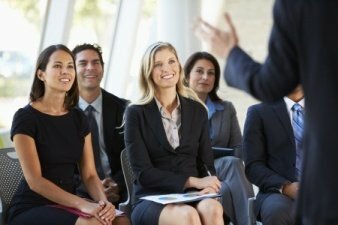 Persuasive Speeches can show you how by helping you ..
- Find tested and proven techniques to deliver your persuasive speech. There are also speech ideas for special occasions including Graduations, Valedictory occasions, special Birthdays, Retirement and Farewells, and Eulogies. Also how to use humor in your speech and when it is appropriate. "The introduction from the Master of Ceremonies is clear and precise. From the middle of the room she stands ... pushes her chair carefully under the table and with confidence and energy she walks to the front of the room … and turns. With eyes gleaming, she stands there for a second. Straight with a touch of enthusiasm in her stance, her hand slowly rises and a few words are uttered ... and we are all involved ... Words flow as in a river … I am seeing her point. What did this speaker do that made all the difference? Why are some speeches more persuasive than others? Are some speakers simply able to use better words? Do some speakers know secrets to giving a speech that the rest of us do not know? As I personally strive to become a better speaker, I continually seek to find such answers. The answers I discover will appear here. Here is where you will find TESTED and PROVEN solutions and answers, not theory. Here is where you will find POWERFUL and persuasive words, resources and tools for your speech. Use the SITEMAP/OUTLINE to build your speech step-wise from beginning to end, from overcoming the initial fear and barriers to the celebration of the delivery of YOUR powerful speech. and the world today needs great communicators. YOUR speech can be a persuasive speech, motivating and humorous. YOU can inspire people with your words. Believe me YOU CAN. Here are the truths to make it possible, at High School, College, University, in the Town Hall or the Board Room.